Author’s note: This is the first installment of a three-part series of articles. J.I. There is a joke that GPS units don’t work well in Rhode Island because we always give directions by where things used to be. A case in point is the corner of Route 44 and Smith Avenue, where the Wood Items & More craft supply store is located today. There are some who still refer to it as, “the old Benny’s hardware store”, even though it hasn’t been Benny’s since about 1970. Others like to point out that at one time it was also the site of Oscar Tobey’s general store, a Greenville landmark that helped to weave the tapestry of Smithfield’s history. Tobey’s was unique in that it was a general store, a post office, a jail, a social center, a stage coach stop, and a make-do town hall, all rolled into one. 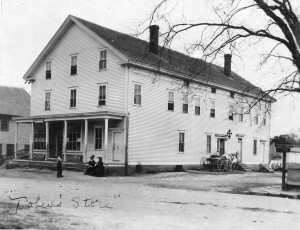 Built in the early 1800s, the store was initially run by William Tobey, who leased the building from a local businessman. William’s son Oscar was born in 1837, and grew up helping his father at the family business. Oscar was educated in local schools, and went on to higher learning in Massachusetts before eventually returning to Greenville to run the store when his father retired. In 1868, Oscar was elected to the Smithfield Town Council, and held his seat until the division of the town in 1871. Under the new town organization, he was elected Town Clerk, a position responsible for the accurate recording and preservation of town records. Before 1871, Smithfield’s Town Hall had been located in Central Falls, but after the division Central Falls became part of Lincoln, leaving Smithfield as we know it today without a formal seat of government. Since Oscar was the Town Clerk, it was agreed that he should keep all records pertaining to the new town of Smithfield at his store where he could administer to his office between serving customers. Greenville’s first post office was established in 1823, and although it is unconfirmed, it’s been said that it was located in the building that housed Tobey’s store. In later years, beginning in 1861, William, and later Oscar, both served as Greenville’s Post Masters. Of collector interest today are the many vintage picture postcards produced by H. Tobey Smith in the early 1900s that were sold and mailed from the store. If one happens to find one of these postcards with a “Greenville” postmark, there’s a chance it was cancelled by Oscar Tobey himself. Tobey’s store had two wrought iron cells in the basement that served as a “bridewell” to house prisoners waiting to be brought to court, or who just needed to “sleep it off”. A bridewell is an old English term meaning jail, and the term was used with regularity in town records up to the 1930s. When a prisoner was lodged, a constable was assigned to see to his needs. Town records indicate that it was the constable’s responsibility to pay for food and other necessities out of their own pocket, and then submit a bill to the Town Council for reimbursement. Oscar Tobey died in 1917, and the store came under the new management of Walter A. Battey, and his son Raymond. Raymond’s son, Ralph Battey, still lives in Greenville and remembers helping at the store as a young boy. He related how his father and grandfather had run a store in Rockland, (Scituate), but had to relocate due to construction of the Scituate Reservoir. They came to Greenville and leased the store from Nicholas Winsor who owned the building at that time. The town continued to maintain the jail cells in the basement, but Ralph doesn’t remember them being used very often. He said his father kept a pistol under the counter, but the only time he remembered seeing it brought out was the day a group of rough looking characters entered the store. His father simply placed the gun on the counter and they left. The store sold a lot of groceries, and Ralph’s father owned three Model-T Ford trucks that made morning and afternoon deliveries. All one had to do in those days was call the store and place an order. Most of Greenville’s citizens were steady customers who got deliveries every week. In the pre-dawn hours of January 23, 1924, a fire swept through Greenville which destroyed the store and temporarily put them out of business. They relocated nearby until a new brick building was constructed on the same site. In fact, the new building was built on the same footprint as the old store, utilizing the original fieldstone foundation. W.A. Battey & Son reopened in the new brick building later that same year, and remained there until 1927. The grocery store continued under a franchise called Nicholson-Thackery, which went out of business during the Great Depression of the 1930s, and was replaced by another grocery chain known as First National Stores. In the 1950s it became a Benny’s hardware store, and between the 1970s to the early 90s, it was occupied by a milk store, a clothing store, and flooring company. In 1998, the building was purchased by Maureen and Robert Van Herpe who opened the Wood Items & More craft supplies store, and it remains so today. One small mystery related to the building is the approximately eight by ten foot vault located to the rear. Some say it was built to store town records, but research has revealed that this is unlikely, for all town records were permanently transferred to Georgiaville in 1923. Others think it may have served as a bank vault, but that too seems unlikely since the building was never used as a bank. The two 19th Century jail cells are still in the basement, but now they can only be accessed through an outside door, and not from within the building itself. Since buying the building in 1998, Maureen and Robert have tried to retain the original character of the structure while making necessary renovations. For generations a business has stood on that site dedicated to serving the community, and the Van Herpe’s hope to continue that tradition. Next in the trilogy: The Great Greenville Conflagration of 1924. Filed Under: Articles Tagged With: Greenville Fire Department History, Greenville R. I. First Post Office, Nichola Winsor Greenville R. I., Oscar Tobey Smithfield R.I., Oscar Tobey Smithfield Town Clerk, Oscar Tobey's Store Greenville R. I., Smithfield R. I. Bridewell, Smithfield R. I. Jail, Smithfield R. I. Town Hall History, Walter A. Battey Greenville R. I., William Tobey Smithfield R. I.